The beauty and heart of each farmhouse is the staircase. 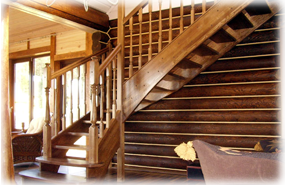 Excellently crafted, highly durable and flexible in design - our wooden staircase options will make you create the rest of the house accordingly! Immideate delivery, great number of design options, complete supply with hardwear and installation. We are in supply and erection of prefabricated buildings for commercial and private use, wooden homes made of both traditional log and frame based houses also. Our range is known for lower overall product cost, optimum performance and durability.